Oh la la how generous :) My guilty pleasure is obviously an inhuman addiction to makeup! Whee, I love giveaways! I love them all, but I don't have anything like Urban Dweller, so I'd probably have to say that's the one I'm most interested in. I had my third day of grad school orientation today, and I am just about schmoozed-out. Small talk is *not* my strength! OMG! Never tried about from LMdB as it's waaaaaaaaay too expensive, LOL. I've heard great things about their eyeshadows though. I think the most expensive brands I've ever bought from is probably... Urban Decay. ~hangs head in shame~ My favourite is Anatolia, and then Urban Dweller.=P My email is chowyuktingterry@gmail.com! I just bought my first LMdB polish, Dionysus from the summer collection. It's just gorgeous. Urban Dweller I think is my favorite from this collection. I love dark polishes especially in the fall/winter. Thanks for having this contest! You already got me hooked on lip cremes. Maybe LMdB polish is next! I actually love winter because of no-frizz hair days and cozy sweaters! Dynasty is my favorite! such a gorgeous red! I do dread winter... i hate the cold and i just moved to GA and im afraid of snow -.- I just want to hibernate through it all. I think Urban Dweller is my favorite...but all are quite lovely! I am a bit of a polish and makeup addict- I own way more of both than I ever wear! My fav color is Anatolia. Hi there! Thanks for the giveaway. I played with Urban Dweller when I stopped by Neiman Marcus and loved it. Don't know why I didn't buy it at the time (probably because I am loyal to my wonderful Nordstrom LMDB SA, or at least try to be). Anyway, would love to enter the contest: e [dot] helen [dot] robinson at gmail [dot] com. Sorry, had to repost because I've been meaning to change the name that shows up! Oh, I dread winter (and autumn somewhat) because my hands get really dry and they crack and bleed if I don't apply lotion CONSTANTLY. This isn't exactly a guilty pleasure but it is fun: I like to step on crunchy-looking leaves! My favorite is Urban Dweller but I'd love to try any of them...the small bottles are so darn cute! I would say my favorite would be Dynasty, with Urban Dweller a close second. My guilty pleasure is cupcakes, and expensive makeup! I love Anatolia. 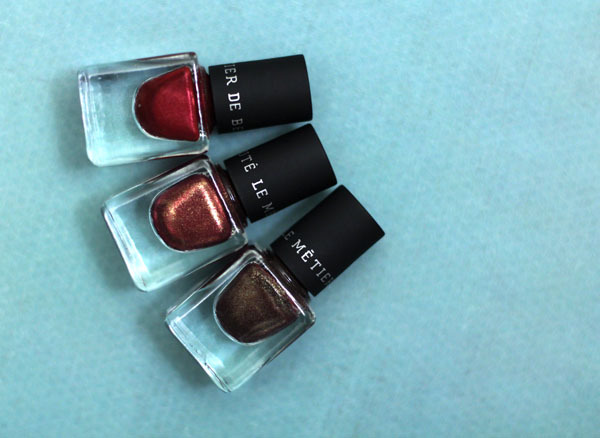 The LMDB nail polishes are the bomb! Lovely contest! Thanks to your beautiful tutorial with the Penelope kaleidoscope, I finally caved and bought it and the champagne dualistic eye pencil during the NM beauty event. So glad I did, I am really in LOVE with them. So, high end makeup is definitely a guilty pleasure! I think my favorite polish of the 3 is Anatolia. Urban Dweller looks amazing. Really falling in love with LMDB. Anatolia is definitely my favorite. Thanks for the giveaway! And good to see you back posting regularly. Anatolia is my favorite -- so gorgeous! My guilty pleasure is '70s color-blocking: oranges and reds, reds and purples... I think Anatolia would look GORGEOUS with a red blouse and my mustard midi skirt :)!! I think Dynasty would be my pick here. There's something about reds that really has me going this year! Thanks for this giveaway =) My gmail address is "cuteandmundane"